Not much I can say about this really. 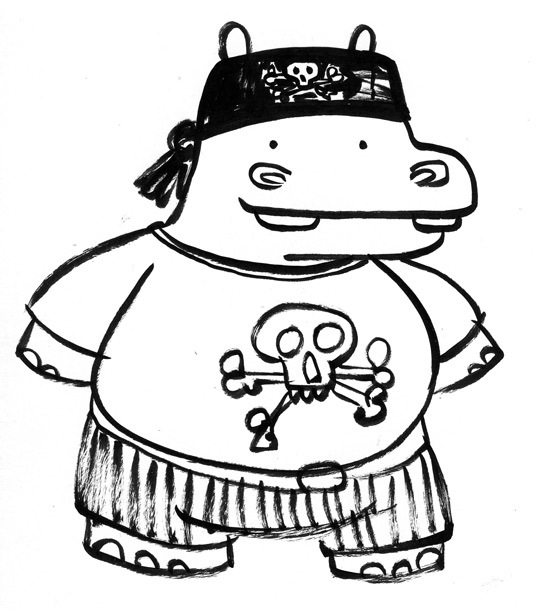 I’ve been busy all week drawing pictures for a secret project. I’ve been desperate to put some of them online as they’ve turned out better than I’d hoped, but, you know, I’m trying to keep it secret. 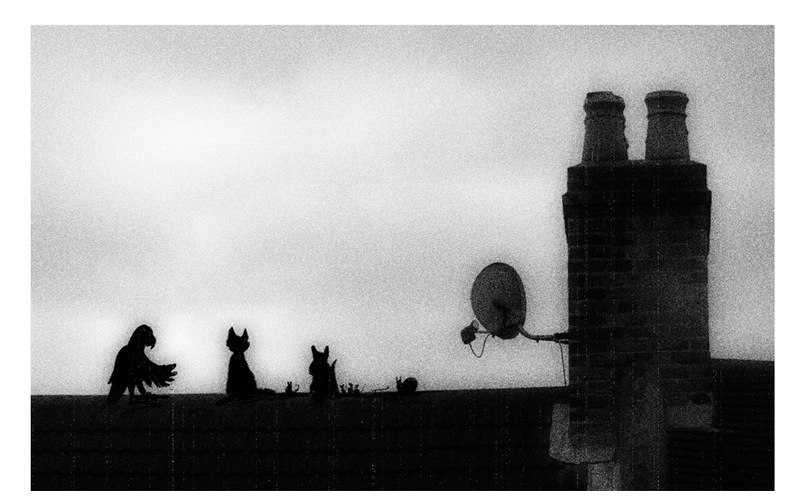 So, I’ve decided to post this mysterious image, just to scratch an itch. I’ve recently put the 4th yeti book to bed, so I’m ploughing on with new things. New things mean new characters, which are always exciting. It means I get to draw a multitude of faces, working out who’s going to be who. 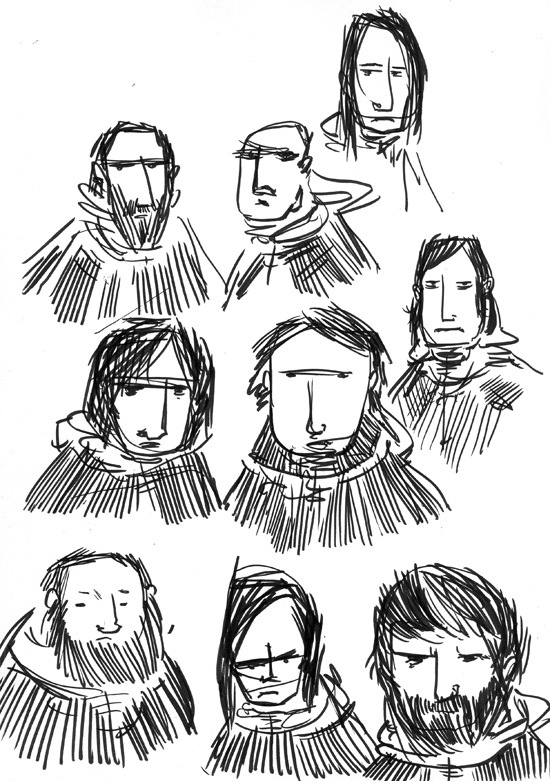 I like the process of brainstorming faces – watching films for features I like, doodling face shapes and seeing what works for a character. I’m not going to talk about these characters as the story – a novel – is something I’m keeping close to home for a while. I’m rarely secretive about stuff, but this story warrants it I think. Still, that doesn’t mean I can’t show studies and doodles, does it?! 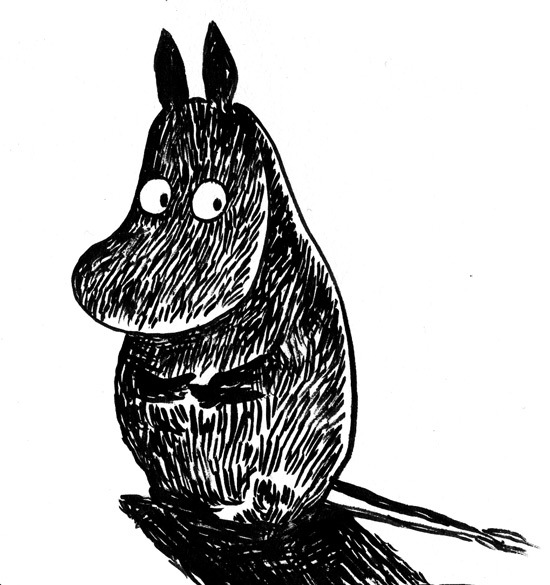 Any way, the illustration I chose is a full-page plate, which is quite different from most of the Moomin illustrations. It’s possibly my favourite, and it’s the only one I can think of where the chiaroscuro lighting allows for the full 3D shape of Moomintroll to be described. Once again I drew it in ink with a paintbrush, forcing myself to not make mistakes and do it without under-drawing. And crikey, what a lot I learnt. Starting with Moomintroll, the greatest lesson to be had is the direction of the pen marks, and the use of the highlights. Tove Jansson was a master of using stark contrasts, and by leaving the band of white inside the outline, Moomintroll’s belly really pops out! Another example of the line direction can be had in the window. Again, the white is as important as the strokes, but the swirling effect of the lines brings out the beauty of the moonlit night. It also provides a contrast against the vertical strokes that colour the wall. 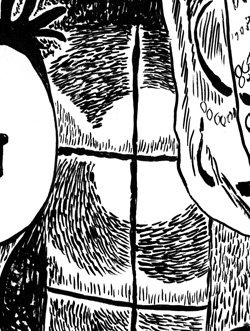 The method of shading the illustration is also of massive importance. There are some huge areas of pure black, and some huge areas of pure white. It’s a surprisingly brave thing to do, but never once do they take your attention away from the subject. The composition is perfect, as is the lighting. And finally, the best thing that I’ve taken away from attempting to draw like Tove Jansson, is how time-consuming and patient you need to be to create work like this. I don’t know the size of the original, and it has a far better use and economy of line than mine, but the work involved in creating a piece like this is exceptional. 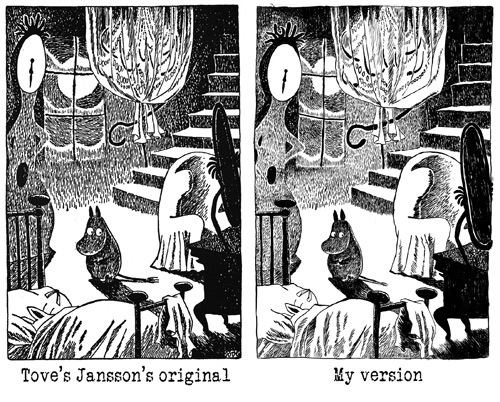 I admire Tove Jansson now more than ever! 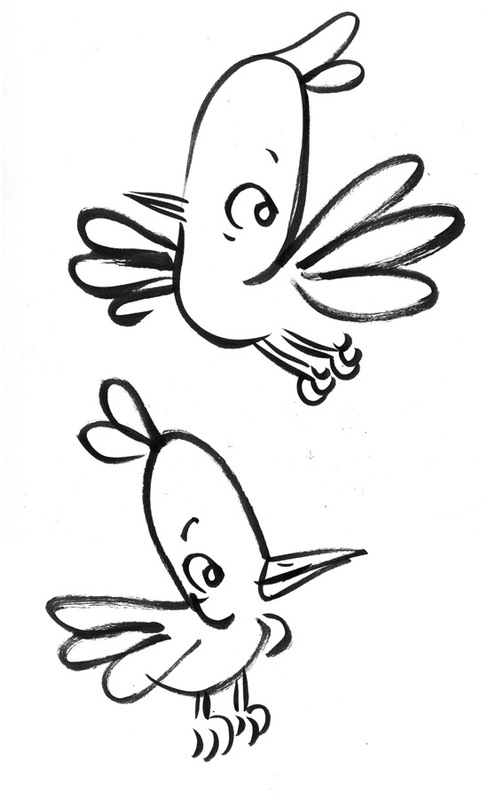 I’ve been drawing a lot of late – in bed, on the trains, in school staff rooms. Obviously, this drawing is extra to yetis book 3, which I’m very pleased to say is nearing completion. 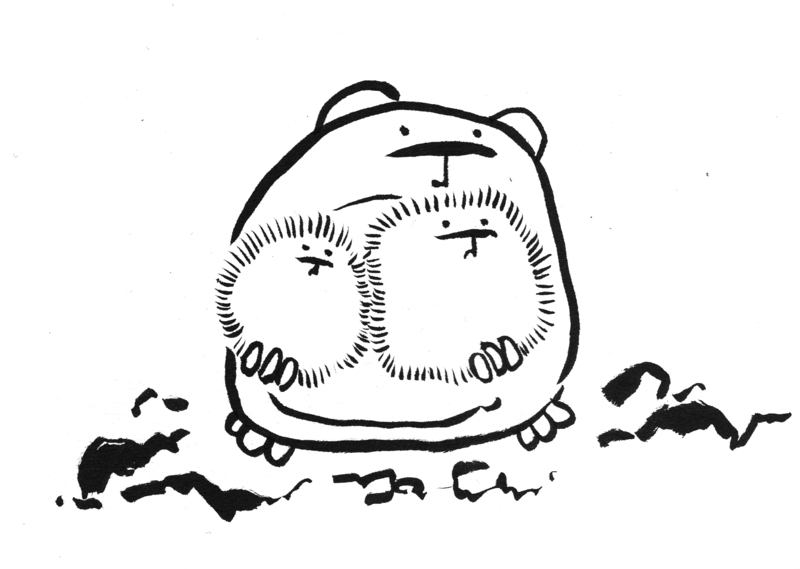 The scribbles and doodles seem to revolve around my hamster friend, Harold, as well as many vikings. Harold is one of those characters that appeared almost fully formed, and yet also out of a need for a foil for Pigsticks the pig. Pigsticks needed a friend to get up to stuff with, and Harold arrived on the page without much trouble. His attitude is just perfect for a sidekick to the energetic and super-positive pig. The more pictures I draw of Harold, the more I love him, and the more situations I want to put him in. I love to see how he reacts to things, and I’m currently enjoying making him look after a load of baby hamsters. Baby hamsters don’t have any features other than eyes and a nose, in case you were wondering. 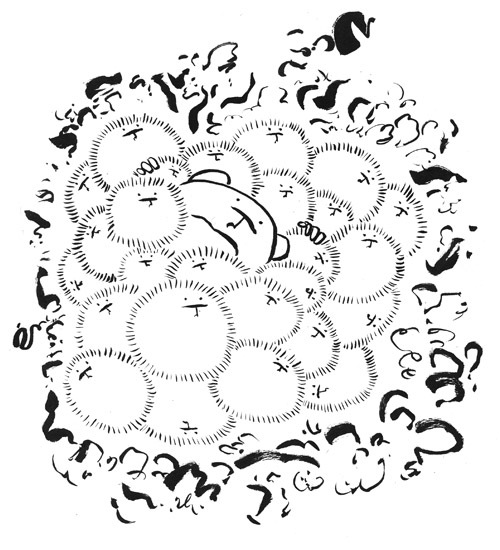 And here’s Harold again, covered in the little monkeys! He’s fast becoming overrun with them!